You can add or manage the address books in the Contacts page. The address book is a collection of address books or address lists, created from your InLoox PM contacts. InLoox PM Web App also offers an InLoox address book that allows users to manage InLoox PM contacts in an easy and comfortable way. Click Contacts in the lower left corner of the home page..
On the Start tab, in the Address Books group, click Manage. Create a new address book Click New. In the New Address Book dialog box, type a name in the Address book name field. Activate the Visible for all users check box, if you want to share this address book with the other users. Click OK.
Edit an existing address book Choose an address book from the list and click Edit. The further procedure is the same as in the point above. 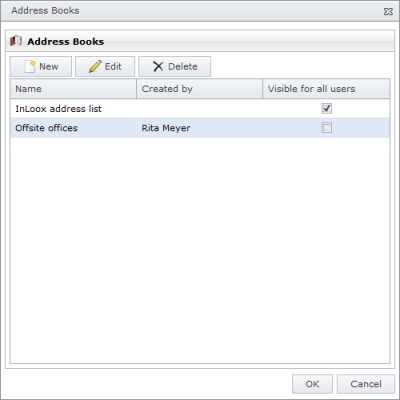 Remove an existing address book Choose one address book from the list and click Delete. Now, you can see all changes in the drop-down list Address Books in the Address Books group. How to Edit an InLoox PM 7 Web App Address Book • Copyright 1999-2019 © InLoox GmbH. Tous droits réservés.